Confessions of a Fabric Addict: Can I Get A Whoop Whoop? A Jewel-Toned Supernova! Can I Get A Whoop Whoop? A Jewel-Toned Supernova! It's finally Friday again! After a week of unseasonably (and gorgeously) warm temps, we are back down in the 30's again - but that just means more time for sewing and quilting, doesn't it? And that's good cause to whoop it up a little - so it's a good thing it's Friday! Let's get started! A couple of weeks ago, my daughter called me and asked if I could make a quilt for her. (This doesn't happen very often!) (surprisingly) Her two youngest kids, Emmy and Nathanael, are both deaf and because of that, have an interpreter assigned to them at school - an adult who acts as a go-between as they attend classes, interpreting things they don't understand into sign language and also helping others understand them if there's a communication problem. This particular interpreter has been with them for two years now and this will probably be her last year with them, and Nancy wanted to see if I would make a quilt for her. Of course! After much sifting through Pinterest, Nancy pointed out a quilt she liked that was very similar to my Supernova pattern. When I called her attention to it, she agreed that it was perfect. Lots of texting then occurred, with both of us sending fabric pics back and forth from our respective parts of town, and we decided on jewel tone batiks in blues and purples against a black background. 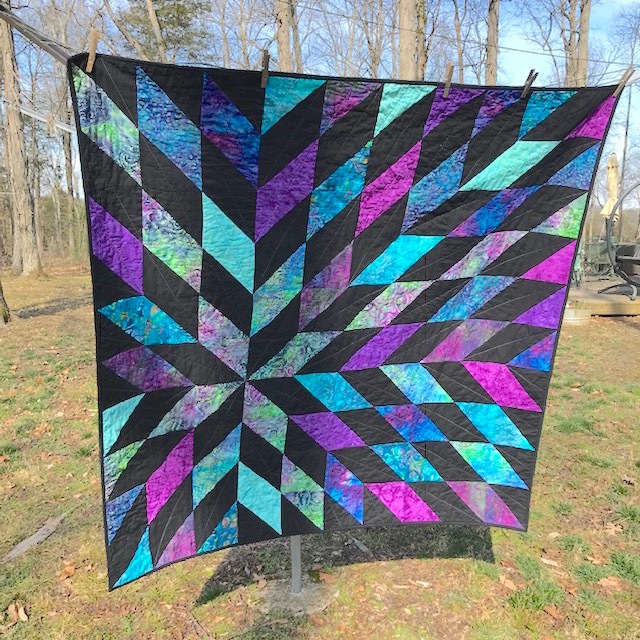 There really isn't anything prettier than sunlight glowing through a quilt flimsy, and jewel tones make it especially lovely. I had quite a time taking this pic, though, because the wind was blowing fiercely! Quilting consisted of straight lines through the long axis of each diamond, radiating out from the center of the focal star. This is an easy way to quilt, although a lot of quilt wrangling is needed when working with a walking foot. It does make for a soft quilt! I used a variegated purple thread for the quilting. And of course, the label! The kiddos (actually I think their mom!) 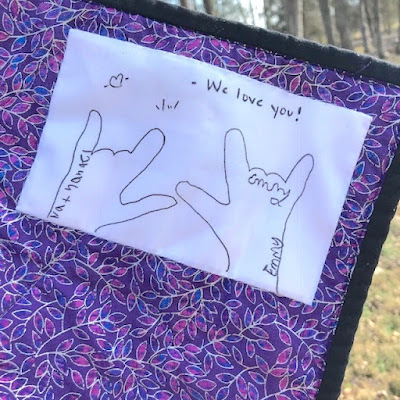 traced their hands making the ASL sign for "I love you" and wrote their names on them. As you can see, Emmy wrote hers in cursive, and then printed it in case her interpreter couldn't understand her writing! When I started doodling calligraphy on the back of placemats when we went out to eat, Emmy (our little artist) just decided it was another form of art and started writing in cursive too. We've had a hard time explaining to her that she can't write like that on her school papers - her teachers can't always figure out what she's saying! But it is cute that she does it, and really very well. That quilt is absolutely stunning! I'm sure their interpreter will cherish it. I'm with you on the bloc-loc rulers. I borrowed one once, and it was fabulous. I definitely need to get a few of my own at some point. Oh, that quilt is so pretty. I'm sure the recipient will love it. The label is so neat. Love my BlocLoc; I have the 4.5" and I need to get the 6.5". What a lovely gift for a sweet person. I am sure they will miss her when she goes. The quilt is lovely. What a wonderful keepsake for the interpreter! I made white and blue ones before when you shared the pattern. I have some Kaffe and white HSTs that need trimming so I can make another. Yours is very brilliant. Your quilt is stunning! Can't go wrong when you add purple! Love the label too!!!! LOVE this quilt! (So much that I have a mini planned.) I'm sure their interpreter will, too!!! That is just about the sweetest quilt ever in purpose and color, and I so love the label. How perfect! It's awesome. The colours are so vibrant. I'm sure she'll love it. against black. She will cherish the signatures for years to come. Really love your new Super Nova quilt. I may just have to make one. This quilt is beautiful and what a precious gift for an awesome person. My daughter is a speech therapist and her minor was in deaf communications. She taught the kiddos from around six months old certain signs before they could even talk! Love it!! Love and appreciate all those who help children be the best they can be!! Beautiful quilt, I love your color choices and it goes to a very special person for your family! Lovely. Sarah, you have two deaf grandchildren? I bet they add so much love to your family. I was concerned that my new grand baby was blind. She isn't, but I recall wondering which would be a more difficult life - blind or deaf. I just cannot imagine life without sight or sound. I love your quilt and I love the story of who gets it. She deserves it so much! 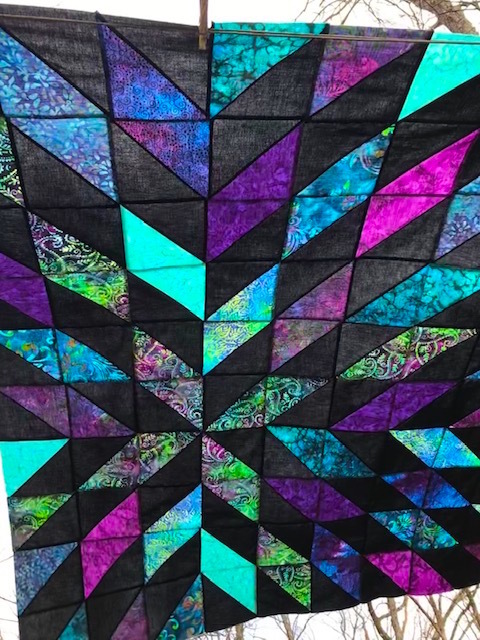 This seems like the perfect place for a Supernova quilt. The interpreter allows your grandkids to shine bright, right?! I love this every time I see it and have no idea why I haven't made one yet. I like those Bloc-Loc rulers, too. When I was cutting 300 or so HST this last fall, a friend let me use her Creative Grids square up ruler (it has great diagonal markings)and I loved it even more. Just thought I'd mention it as you never know when a slightly different tool might be the one you need. Most schools don't even teach cursive anymore. Sad thing. How do kids learn to sign documents if they don't know cursive? Nice quilt and label. Did you know that there is a sign language paper pieced block out there? I have it printed out and will make it one day.